We have seen a positive turnaround in the brand following a challenging trading period in which we experienced the impact of a constrained economy and lingering effects of last year’s social media fallout. 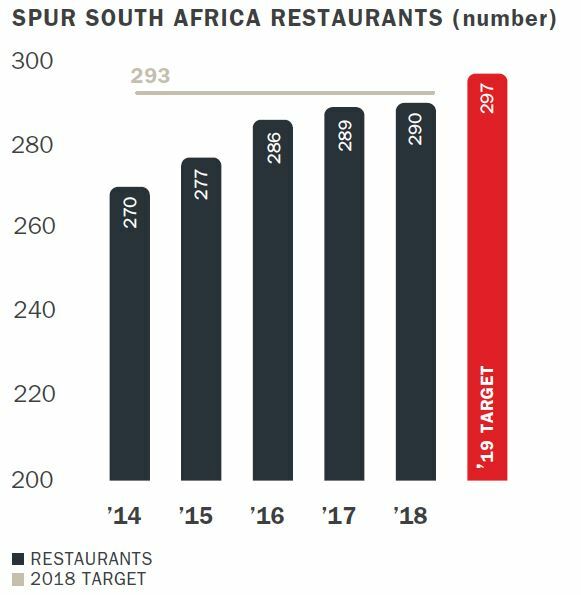 Total restaurant turnover decreased by 2.8% to R4.35 billion (2017: R4.48 billion), and existing restaurant turnover decreased by 4.9%. 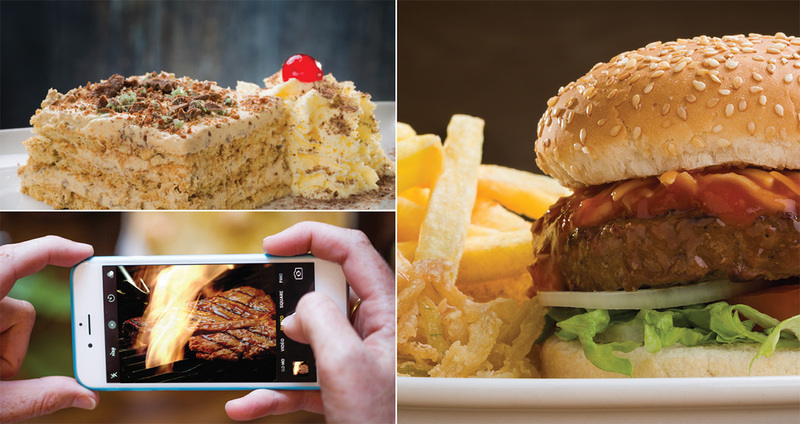 For the sixth year in a row, Spur won the Sunday Times Generation Next Survey Award for the “Coolest Place to Eat Out” and retained its position as the retail brand in South Africa with the largest presence on Facebook and Twitter. We are focused on maintaining our position as a leading digital brand in the retail food industry. The Spur Family App now has 82 000 active users. We will further leverage this asset to ensure a seamless in-restaurant customer experience. This includes possible in-app payment and more. 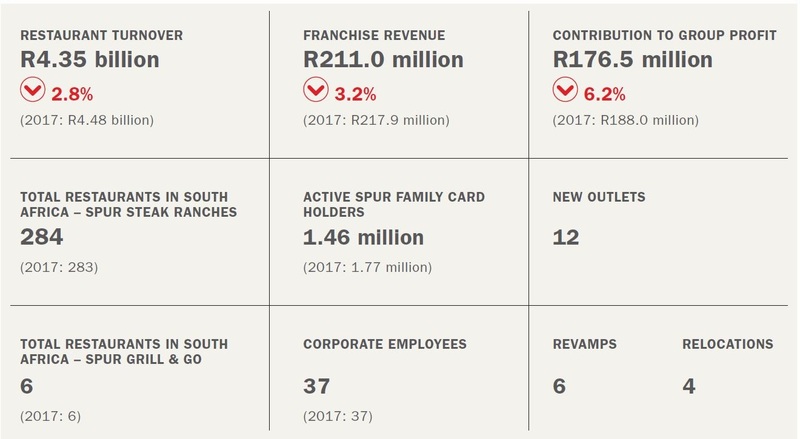 The Spur Family Card continues to perform well, with 1.46 million active members and R1.7 billion in loyalty turnover over the past year. 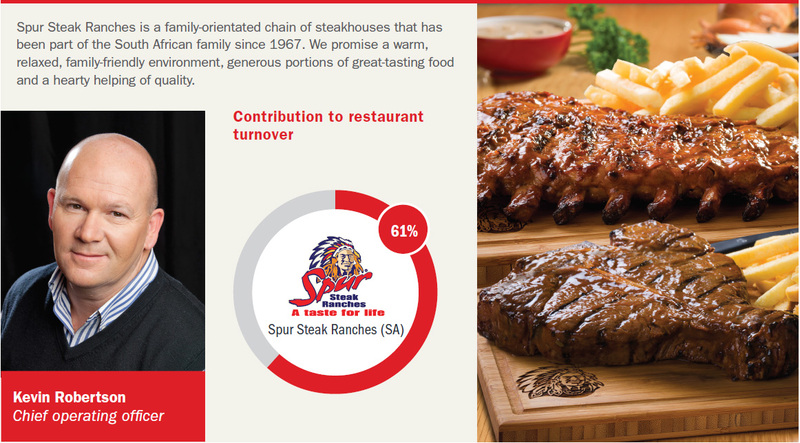 The redemption rate of Spur Family Card vouchers remains healthy at 64%. Secret Tribe birthday vouchers received renewed focus and their redemption rate increased by 14.7%. We introduced a monthly SMS application to advise customers of special offers and voucher entitlements, which sent just over 3 million text messages during the financial year. The eGift voucher platform continues to deliver good results, with voucher sales of over R10.1 million and a redemption rate of 92% for 2018. Our business portal, which allows businesses to reward their employees or loyalty members, has more than 30 companies utilising it and is showing encouraging and consistent growth. 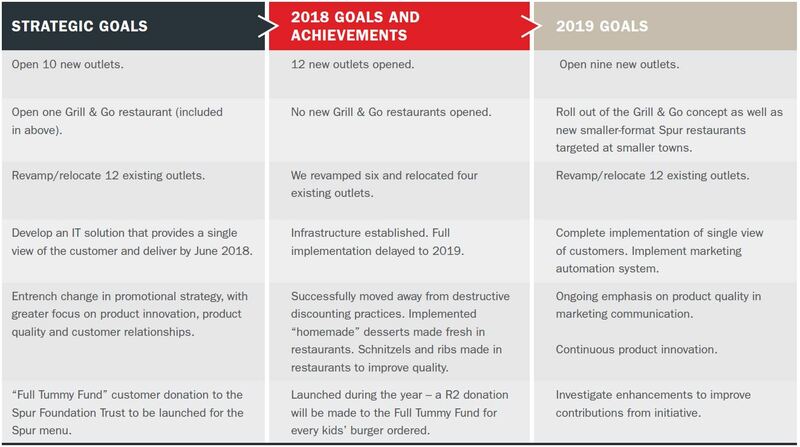 We will continue to focus on menu engineering and product innovation to respond to customer needs. Product quality is critical, and this will receive ongoing attention. Marketing initiatives will focus on the authenticity of the brand and quality of its products. Following the launch of our app during the year, we will proceed with adding functionality over a period, to improve our interaction with our customers and offer added convenience. Refurbishments and strategic relocations will also continue. We will also be assisting franchisees in trying to reduce restaurant sizes and improve trading densities to improve their profitability.